I'm running BL Helium in as a Virtualbox guest VM. When I select the 'exit' option from the context menu, the CPU usage immediately increases to 100% and never returns to normal levels. The fading gradient of the bl-exit panel gradually comes through very slowly and seems to be updated once every few minutes. Yet, even when the bl-exit panel seems to be fully available, I cannot select any option. Although the system appears to be entirely frozen, the only thing that seems to work is the conky menu, which is able to show the correct CPU usage and the uptime is updated correctly every 1 second. I notice that the tooltip in the top-left has also changed by hovering over the X browser icon but I cannot seem to make it change again. I suspect I had left the mouse cursor hovering over the icon for a very long time. Hovering my mouse over any other icon in that area does not change it a third time. Is there a way to disable bl-exit? This seems to be the root cause of the problem but I cannot diagnose why (nothing in syslog). When launching bl-exit from the context menu option, 'Exit, the CPU usage rockets to 100% and never idles. Or perhaps I can change the 'Exit' option on the context menu to simply invoke 'sudo poweroff''? How does bl-exit work if you disable compton first, then exit? In the Scripts thread, there is a minimal exit script, you can try that. Simplified code, same options. There is an alpha fade in going on there that sounds like it's smashing your computer. 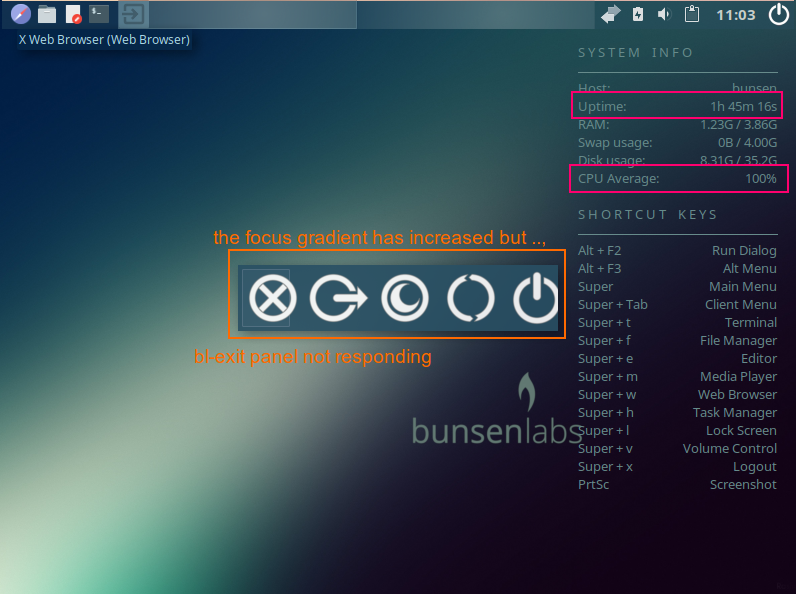 You can try to run the Classic BL-exit by adjusting the theme settings. Go to ~/.config/bl-exit/blexitrc and set the theme entry to Classic and see if that helps. @PackRat - I'm not familiar with compton or disabling it. I found the .config/compton.conf but it seems one can only disable individual components (shadows, opacity, fading etc...). Is there a a more generic and recommended way to stop or disable it? @tknomanzr - I did look for ~/.config/bl-exit/blexitrc but was unable to find it. 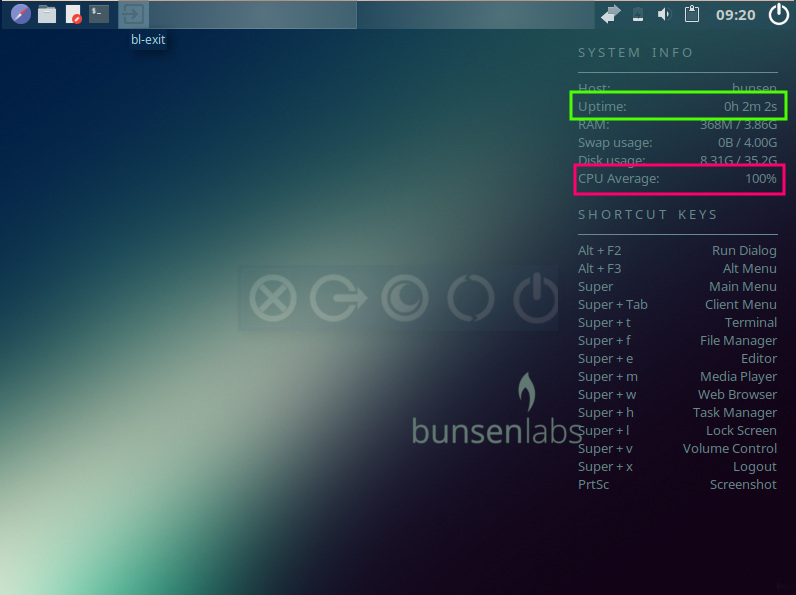 The closest I could find was ~/.config/bunsen/bl-welcome, but nothing for bl-exit under ~/.config. One can easily disable the compositor from the right click menu. Preferences/Compositor/Disable Compositing, or # it out in the autostart file. D'oh! So easy - I did not even know that option existed on the context menu. It just proves that I never go into that area thanks! ~/.config/bl-exit/bl-exit/bl-exitrc is the file you are looking for. When set to Classic, it will default back to the old Crunchbang style menu, which is considerably less resource hungry than the Helium theme. The theme setting is on line 56: set it to classic. Thanks guys and girls for all the suggestions. Before trying to disable Compton, I copied the bl-exitrc from /etc/bl-exit to ~/.config/bl-exit/bl-exitrc and changed line 56's value to classic. Now, when selecting Exit from the context menu, I see the classic version of the dialog box and the system no longer locks up. I'm not sure what caused the original problem, but I appreciate this solution. Thanks for all your suggestions! "sudo reboot" and "sudo shutdown" probably need to be replaced by "systemctl reboot" and "systemctl shutdown". Nice, I remember that one and is it useful with Fluxbox as well?